To many people today, using the words "factory" and "farm" in the same sentence is nothing short of sacrilege. In many cases, though, the same sound business practices apply whether you are producing cars or carrots. Author Ben Hartman and other young farmers are increasingly finding that incorporating the best new ideas from business into their farming can drastically cut their wastes and increase their profits, making their farms more environmentally and economically sustainable. By explaining the lean system for identifying and eliminating waste and introducing efficiency in every aspect of the farm operation, The Lean Farm makes the case that small-scale farming can be an attractive career option for young people who are interested in growing food for their community. Working smarter, not harder, also prevents the kind of burnout that start-up farmers often encounter in the face of long, hard, backbreaking labor. Lean principles grew out of the Japanese automotive industry, but they are now being followed on progressive farms around the world. Using examples from his own family's one-acre community-supported farm in Indiana, Hartman clearly instructs other small farmers in how to incorporate lean practices in each step of their production chain, from starting a farm and harvesting crops to training employees and selling goods. 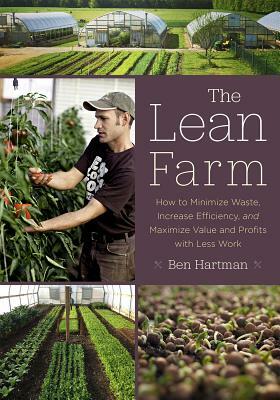 While the intended audience for this book is small-scale farmers who are part of the growing local food movement, Hartman's prescriptions for high-value, low-cost production apply to farms and businesses of almost any size or scale that hope to harness the power of lean in their production processes.